An 18-year-old landscaper was killed when he was run over by a company vehicle. The one-ton truck was loaded with sand and parked facing downhill on an inclined driveway. The young man was asked to shovel sand under the truck, which was leaking oil. He then crawled under the truck to check the origin of the leak. As he lay under the vehicle, he asked a co-worker to verify if the parking brake was on. While doing so, the co-worker unknowingly released the brake. The truck began moving forward down the driveway and, before it could be stopped, ran over the victim lying underneath. The vehicle’s mechanical condition was sub-standard. The engine was leaking oil and the automatic transition (parking pawl) was defective. 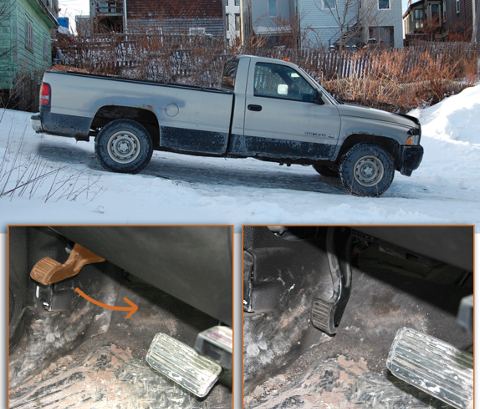 As a result, the park position was not able to hold the truck without the parking brake being applied. The victim placed himself in a dangerous position by crawling under the vehicle. Also, the victim did not verify for himself that the parking brake was applied. Instead, he asked a co-worker to do so while he was under the truck. The co-worker was not in the driver seat when the parking brake was checked. It was therefore impossible to promptly stop the vehicle when it began to move. Older vehicles require more maintenance and frequent inspections than newer ones. Employees must report defects to their employers immediately. Employers must maintain tools, equipment, machines and devices in good condition. Vehicles left in the park position must have their parking brakes set and the wheels chocked. This is particularly important when the vehicle is parked on an incline. Turning the wheels away from oncoming traffic will also ensure the safety of others if the vehicle begins to move. Young workers have been found to be at a greater risk for workplace injuries. They must be given sufficient training and instruction to safely perform their duties. Closer supervision may also be required until the supervisor is confident that young workers can perform their duties safely.